Allnigeriasoccer.com understands that Southampton are in advanced talks with promising Nigerian defender Oludare Olufunwa over a new deal. 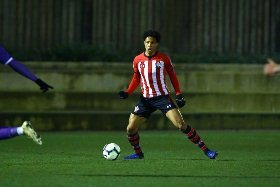 The highly-rated teenager is in the second year of his scholarship with The Saints, meaning he could walk away as a free agent at the end of this season, if talks are not fruitful. Born in Southampton to a Nigerian father and English mom, he is open to representing the Flying Eagles at next month's FIFA U20 World Cup and it is understood that his representatives have made initial contact with the national team's coaching staff.